Around my house there are a lot of cyclist that take a bike trail from the beach areas and through the community, I have seen my share of bike accidents and injuries, and most of the time, the cyclist has nothing with them to help themselves when this happens. Recently I saw the neatest first aid kits that can be attached to your bike and left on at all times. You can have access to the things you need should an accident occur. SJ Works sent me a great bicycle first aid kit for my family, I was so excited to be able to have this for when we took our grandkids out riding bikes. We used it the very same weekend we received it on one of the kids, when we took the older two to ride at our local park. Between the 4 year old and 6-year-old just learning to ride, you know we were an accident waiting to happen. The oldest fell and scraped her leg pretty bad on the bike pedal. We could have waited to treat the scrape until we got home, but she was pretty upset and did not want to continue riding. We stopped and took out the kit, found a wet antiseptic wipe and cleaned it up well and dried it with a gauze pad. We put a bandage on it and we were on our way again. We would have ended up having to end our day early had we not had the first aid kit. 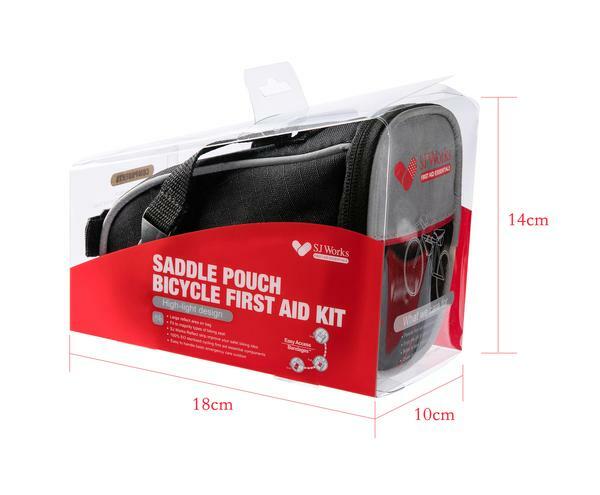 SJ WORKS bicycle first aid kits comes with comprehensive wound cleaning and closure supplies, including multiple bandages, sterile gauze rolls and sterile pads, not to mention the various alcohol, antiseptic, and antibiotic wipes and ointments. It’s the perfect emergency kit for all sorts of common injuries. Your phone easily fits in the top of the kit! I always tease my husband about him being a safety dog, but on this day in the park I was glad he reminded me to take the first aid kit and attach it to his bike. It was a great place to keep his phone should we needed to call 911 and gave us peace of mind. You just never know when you are going to run into a situation when you need first aid, and getting scrapes and cuts treated quickly can prevent infections and complications. It also can save the day when you are out and need to just bandage yourself up. Check out SJWorks First Aid kits on their website, they have all kinds of solutions for your biking first aid needs.